The implementation of —high-accuracy— perturbative techniques in general relativity plays a key role in the new era of ‘precision gravity’. The workshop will gather worldwide experts to discuss state-of-the-art computations of the dynamics of binary compact objects in Einstein’s gravity. 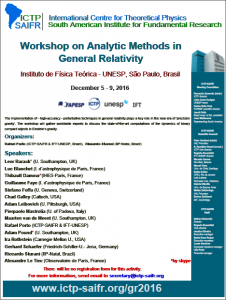 There will be no registration form for this activity and for more information please send E-mail to secretary@ictp-saifr.org.